In a victory for dogs and those working to end the dog meat trade in South Korea, rescuers have successfully shut down another farm and topped off a rescue effort by demolishing the cages that once held dogs being raised for their meat. In September, Humane Society International (HSI) helped negotiate the closure of a dog meat farm in Chungcheongnamdo, saving 103 dogs who were brought to the U.S. to be put up for adoption. “The first time we saw the dogs, it was really shocking. They were clearly terrified, but once they realized we weren’t there to hurt them, their tails started wagging, eager for the slightest show of affection. They have so much love to give, it’s appalling to think they were destined to be butchered for their meat,” HSI’s director of companion animals and engagement, Kelly O’Meara, said at the time. This week, the effort was finished off with the destruction of rusty cages and bulldozing of the area, which will now be used to grow crops instead. “Few things are more exciting than breaking down cages that once held suffering animals. By allowing us to demolish these cages, the farmer has demonstrated a commitment to abandon the dog meat trade in favor of a humane trade in fruit farming. We hope other farmers follow suit,” said Adam Parascandola, HSI’s director of animal protection and disaster response. According to HSI, which has been heavily campaigning to end the dog meat trade, more than 2 million dogs are raised and killed on an estimated 17,059 registered farms for their meat every year in South Korea. The good news is that this is the third dog meat farm shut down by HSI this year. Attitudes seem to be changing towards dogs and using them for meat, particularly among younger generations. While HSI is working to help farmers transition to other livelihoods, it’s also working to raise awareness about the issue and help encourage people to see dogs as more than animals to be raised and killed for food. Hopefully, even more attention will be brought to this issue as HSI pushes the government to end the dog meat trade before the 2018 Winter Olympics, which will be held in Seoul. 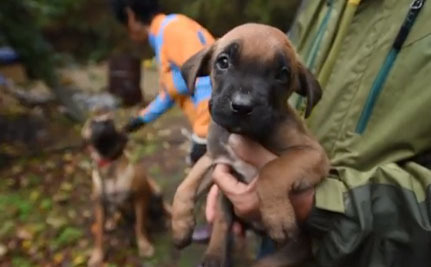 As for the last round of dogs who were saved from the farm, who include nine puppies and their mothers, they were brought to the U.S. last week and will be in the care of the San Francisco SPCA as they get ready to find new forever homes. For more info about the dogs available for adoption and efforts to end the dog meat trade, check out the San Francisco SPCA and Humane Society International’s campaign to bring it to an end. HSI is a great charity which I donate to. We need to lobby the government to shut these hell holes down in south Korea! Just the words "dog meat farm" is an abomination and a complete denunciation of the human race. Thank you for saving dogs and shutting down a dog meat factory, HSI. It is not easy but I hear many people and organizations are fighting against it. Hope all dog meat factories will disappear from the earth someday. Barbarism to voiceless lives do not make our world a better place. It must be stopped.